This is a walk for cliff lovers with some fabulous views across the Gulf of Roses and across to the Pyrenees, but it is challenging underfoot with an uneven rocky terrain and a path that runs very close to the edge of the cliffs around the bay of Montgo (with no barrier). It's a different, dryer type of cliff path to other coastal paths on the Costa Brava. Trying to do the walk in flipflops or other flimsy shoes is not recommended. 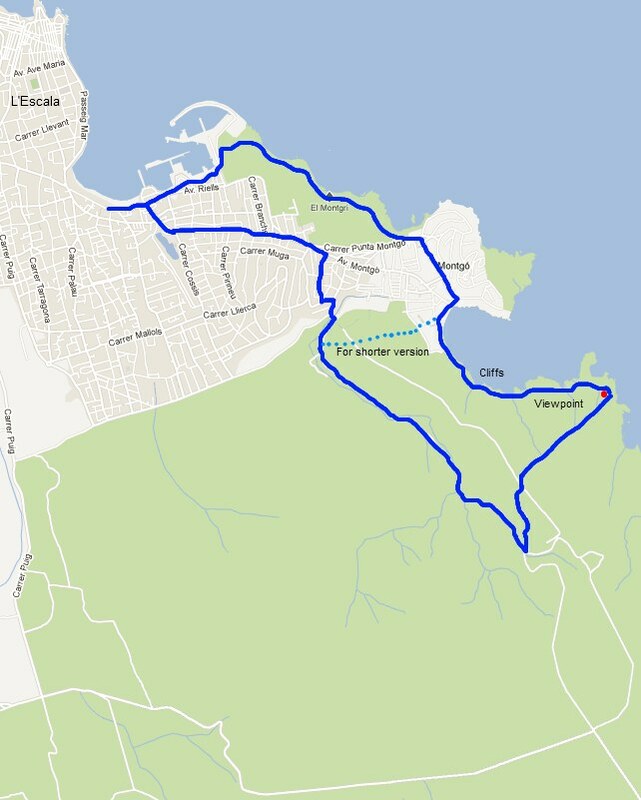 The final viewpoint (shown on the map) though can be reached easily by track if you take the inland path. 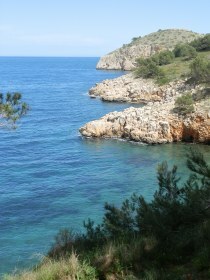 The start point is L'Escala by the beach at Riells. 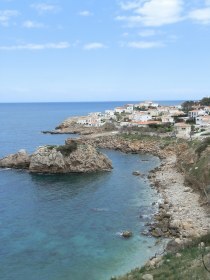 L'Escala is a town in two parts. The older fishing village is at the north end of the town, while the bulk of the Riells area consists of lots of streets of holiday houses and villas from what looks like a big building spree in the 60s and 70s, which can look a little jammed in and careworn in places. Even though some houses have year-round inhabitants, many of the businesses around Riells are seasonal. At this time of year in mid-April, the holiday makers are returning and shops and cafes are starting to re-open, with the first people appearing on the beach, though not in the water yet. We're starting at Riells so as to be able to walk the coast to Montgo from l'Escala, but if you're just interested in the wilder parts of the walk you might just start in Montgo, to save the walk through the estates and town on the way back. We park near the beach. In summer the roads around Riell beach can be packed, but in spring the streets are relatively empty and parking is easy. 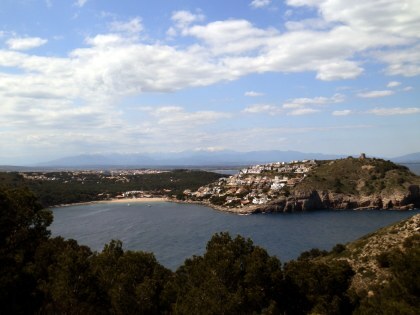 Riells beach itself has great views across the Gulf of Roses to Cap de Creus and Empuriabrava. The beach is northerly facing and open to the wind. To prevent sand being blown off the beach during winter, there are nets strung across the beach creating undulating mounds of sand, that children are playing on. We walk along the promenade past the rotisserie shop which has a long queue outside waiting for whole flame-cooked roast chickens to take away for Sunday lunch. This is something of a Spanish tradition. Most food on the Spanish coast is thin cut for frying or grilling (in supermarkets it's almost impossible to get a 'joint' for roasting). The story we were told was that traditionally Spanish houses didn't have an oven. Instead if there was a joint or a piece of meat for a celebration, they would take it to the local baker to cook it in the bread ovens. The roast chicken seems to be a continuation of this. The route runs past the port, and we get the first glimpse of a snow-capped Canigou mountain rising up behind L'Escala and the port. At the end of the port the path cuts behind a boat yard and into the rough scrub land behind. We're on the GR92, so keep an eye out for the red-white flashes. Just around the corner are two former gun emplacements from around the time of the second world war, that look up the coast and across the bay to Roses. The path snakes around a few headlands above a couple of very pebbly and rough beaches. Ahead of us is the promentary of Mont-go with it's watch tower at the top, flanked by a small estate of whitewashed holiday homes and villas. The ground is rocky and stony underfoot with the angle of the stones making the ground harsh and uneven. 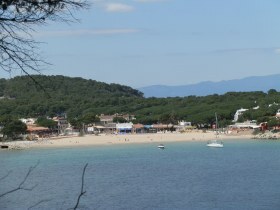 At the estate of Montgo, we cut across the estate and down to the main Montgo beach. There's a small collection of shops and supermarket that have just re-opened and the first handfuls of tourists in the few bars and restaurants around Montgo. 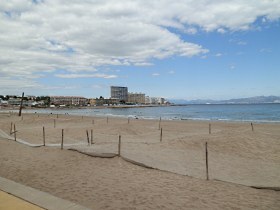 The beach itself is broad and sandy and looks out over a semi-enclosed bay. The water is crystal clear turquoise blue, but still much too cold for swimming. We walk past the beach and follow the signs into the woods above the cliffs. There are a few other walker around and the narrowness of the path means we have to do a little dance to let them pass. The route climbs over cliffs with sharp jutting rocks underfoot all the time, so walking is slow and as we climb, the edge of the cliffs seems to get closer. We are on a GR92 route and from the wear marks on the stones it is well used, but the route is challenging, particularly if you have a dislike of heights and sheer drops. At various points it passes through gorse and low shrubs which can catch your legs if you're in shorts. Compared to other walks, it's relatively slow going, certainly slower than expected. 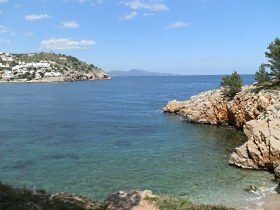 We continue up and down a few small coves, with fabulous views back towards Montgo and across the Gulf. The path down to the last cove is a proper scramble with the path very close to the edge that takes some care to negotiate. Then from this last cove the path climbs up past a refuge hut and up along what is almost a scree path and into the woods where the footway becomes much easier. It's a steady climb up to the top and the viewpoint above the high cliffs. There is the remains of another gun emplacement - large concrete groundworks that would have supported a gun. From the top the view extends across the Empordan plain to the mountains to the west, and northwards almost up to the French coast. Off from the viewpoint is a large track - it would be possible to drive up here - and we follow the track back into the forest, then down into the neighbouring valley and a roadway. The road has a few cars on it, but is otherwise quiet among the trees and relatively unremarkable scenery. We walk down past an as yet unopened campsite and back into Riells heading for the beach and an ice-cream.